Island visited by 54 members. 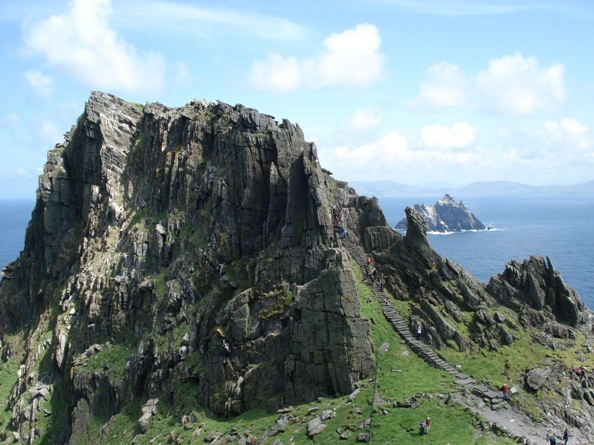 The highest point on the island is known as Cró na Snáthaide, 'eye of the needle', and was visited by pilgrims who kissed a cross-inscribed slab overhanging the abyss. This fell into the sea at some time during the 19th century. As access to the summit is now forbidden to protect the site, a visit to the monastery will count as an ascent of this peak. Sceilg Mhichíl is the 1359th highest place in Ireland. Sceilg Mhichíl is the most southerly summit and also the most westerly in the Iveragh NW area. We climbed this world heritage hill on June 13th 2011 -very sunny and hot day. Needless to say this site is world class and offers stunning views from all sides. It is highly recommended to book your boat trip the day before, certainly when beautiful weather is announced. Only 15 boats a day are allowed to disembark some 150 people max in order to preserve the monk's site and the fragile ecosystem .